Remodeling the bathroom may seem like a fun project, a way to finally create the luxury space you’ve always wanted in your home — but what if you find out you need to replace the bathroom sink or uproot the floors due to water damage? Is there anything less exciting than dealing with bathroom floor damage and trying to figure out what to do? While nobody wants to deal with rotted subfloors, the good news is that as long as you have to fix water damage, you may as well take advantage of the opportunity to update your bath. Now is the perfect time to remodel. Whether you’re reaping the consequences of a leaky toilet, a leaky faucet, an overfilled bathtub or whole-house flooding from years ago, when you discover water damage, what do you need to know? How can you tackle the water damage in bathroom spaces in order to handle things properly? 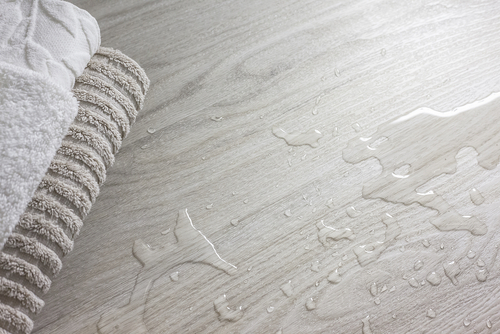 To help answer these questions and give you a clear, accurate guide to fixing your floors, here’s a look at tools you’ll need, steps to take, and a few extra tips to keep in mind when you’re tackling water-damaged bathroom flooring. Turn off the water. Close the main water valve so you can prevent any more water from coming into the room as you work. Prep the area. To protect yourself during demolition, put on leather gloves, eye protection and a dust mask. Start by removing anything sitting on top of the damaged floors — cabinets, the toilet, etc. — so you have an open area in which to work. Next, use a pry bar to remove any protruding nails, the floor’s baseboards and as much of the floor area as needs to be replaced. If the damage is in a localized area, you can just remove that flooring; if it’s more widespread, you may need to remove the entire flooring in the room. Inspect the area. Take a look at the floor joists and figure out which ones are on either side of the water-damaged area. Use a pencil and a straightedge to draw a line through the middle of each neighboring joist, and use a carpenter’s square to connect those lines, creating a clear, rectangular area of damage. Also take a look at the toilet flange — is it corroded? If so, you’ll need a repair ring before you can reset the toilet. During your repairs, you can just block the flange with a rag. Remove damages. Focusing on the rectangle of damage, use a cat’s paw and hammer to pull out fasteners or a drill with a No. 2 Philips bit to remove screws. If the damage is around the toilet area, use a jigsaw to cut a circle around the flange. Use the circular saw to cut along the lines that form the rectangle, overcutting the corners and lift out this area. Use a handsaw to cut the circular section you’ve penciled in. Give time for area to dry. If the joists are wet, ventilate the area and give them a few days to dry thoroughly. Reinforce the joists. Using wood in similar dimensions to the existing joists, nail new wood over the rotted areas, making sure each end is on top of good wood. Cover the gap. Measure the specific dimensions of your rectangular area, and cut plywood or oriented strand board (OSB) to cover it, putting in notches for the flange pipe if needed. Set this new material in place with 2-inch wood screws, leaving a 1/8-inch gap between the new and existing flooring. Use floor compound to fill that gap, level out unevenness, and sand the area with a belt sander if necessary. For mold: In cases where you encounter mold in the flooring, you’ll need to respond to this before moving forward. Try a solution of equal parts white vinegar and water, bleach, or a combination of borax and water to treat the mold. In extreme cases: You may need more extreme responses when damage is especially significant. In these cases, it’s best to speak with a professional. When you notice water damage in your bathroom, the time to respond is right away! By taking action quickly, you can minimize damage from getting even worse over time. Use the tips and strategies above to guide you in making your bathroom better — and when you’re looking for quality products to update your new, repaired bathroom space, come to Modern Bathroom! Your bathroom should be a place where you can unwind. Many people achieve this by remodeling and creating a design that maximizes the space in their bathroom; however, you can use color to create an inspiring bathroom. Below, you will find unique color schemes for your bathroom that both motivate you to conquer the world before work and help you relax at night. Many people stick to a few solid colors when they paint their bathroom — but why not go bold? Striped bathrooms make a statement. If nothing else, these bathrooms say you aren’t afraid to experiment. If you are looking for a creative way to make your bathroom more invigorating, try red stripes or blue stripes. Once you have your stripes in place, juxtapose the look with other patterns to get an elegant design. Sage is quietly making bold statements in home design across the nation. The perfect mix of greens and blues, it’s calming, yet it makes a strong appeal visually. Most importantly, you can create a bathroom design scheme with accents of sage, or you can make everything sage. One famous designer created a bathroom oasis using the color sage as the primary color for everything, even her tub. It worked. It can work for you, too, if you combine the right elements. Use oversized mirrors, wall paintings and other accessories to complete your look. Even better, using one color (generally a light color or a neutral) will make your bathroom appear larger. The list of options for mixing and matching tiles is limitless. Let Mother Nature and clothing inspire your choice in patterns to get a fresh, one-of-a-kind bathroom. Another way to enhance your bathroom? Go daring with horizontal stripes. Vertical lines are usually more utilized when it comes to stripes. Additionally, horizontal lines help maximize your space. If you find that your bathroom could be a little wider, but don’t have the time to invest in upgrading your space, try horizontal stripes. You can achieve this look by painting alternating shades of one color on your walls. Or, you can create horizontal lines by alternating between your favorite solid color and white. Getting a straight line each time is simple when you preplan your wall. If you are a little concerned with color, it’s natural. The color of your wall can seem permanent to some, and the thought of getting it wrong can be terrifying. Fortunately, there is a way to inject color into your bathroom without risking it all — accent walls. An accent wall is when one or two walls in your bathroom are a different color than the rest of your bathroom. Generally, this wall’s color is “louder” than the other walls. For instance, in a cream bathroom, some people choose a red or dark blue wall. Additionally, the wall should be structurally unique; serving as a focal point. Ultimately, you should have fun with your bathroom and make it a place that inspires you! A creative color scheme can give you a look and feel you want in a weekend. Purchase a new supply line to replace the old one, and a new shut-off valve if the original valve is seized or leaky. When you purchase a new toilet, it should come with most of the parts that you’ll need. Check the box and make sure it includes brass closet bolts (to connect the toilet to the flange), and a gasket for connecting the tank to the base, a wax ring, a fill valve, flush valve and flapper. If any of these items are missing, purchase them separately. Here are a few items that you may need to make sure the connection between the soil pipe and toilet are secure. These parts only cost a few dollars apiece, so even if you don’t end up using them, buying ahead of time means you won’t waste time and money on emergency trips to the hardware store. Jumbo wax rings are needed if the soil pipe flange is level with the floor or slightly recessed. If the flange is broken, or recessed below the floor level by more than ¼ inch, then you will need to buy a PVC flange repair ring (often called a spacer ring) or flange extender. Extenders are designed to fit inside the original soil pipe and provide you with a new flange so that you can properly secure the toilet. If the flange is broken or badly rusted so that it will no longer hold the closet bolts, but not recessed, then you will need a thin metal flange repair ring. If the original flange is metal, then the repair ring should bolt directly to the flange. If the original flange is PVC, then you can use a repair ring that fastens to the subfloor around the flange. In either case, you will need a power drill, drill bits and the correct fasteners to hold the ring down to a metal flange, or to wood or concrete subflooring. Lastly, a mini hacksaw that you can use to cut metal is a wise purchase in case you need to cut off rusted closet bolts in order to lift the original toilet off the flange. When it comes to replacement, the process is simple. 1. Before you remove the original toilet, unbox the new toilet and assemble it, starting with the tank. Install the fill valve according to instructions, then the flush valve. Use channel locking pliers to gently tighten each fitting. When this is finished, place the tank gasket on the base of the flush valve and then fasten the tank to the base of the toilet using the tank bolts that came with the toilet. Use a flat screwdriver and wrench to tighten, making sure that you don’t over tighten and accidentally break the porcelain. 2. 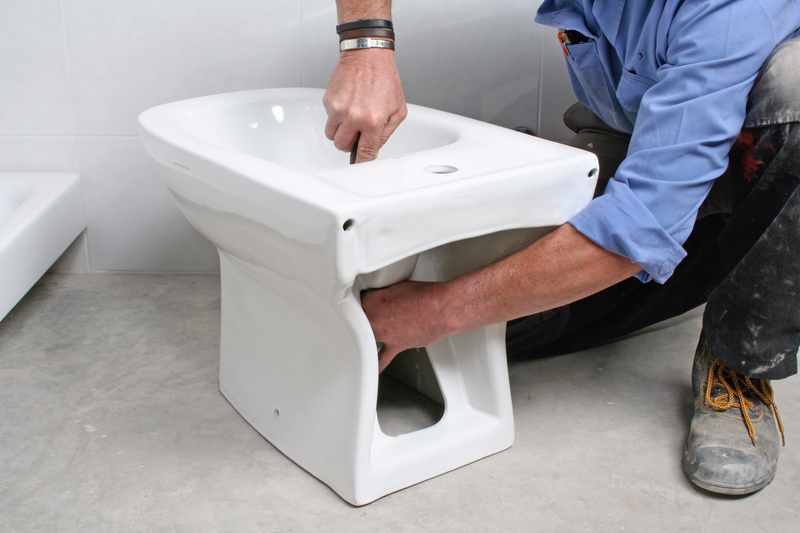 To remove the old toilet, turn off the water supply and then flush the toilet to drain it of water. Disconnect the supply line at the valve. Then, at the base of the toilet, undo the nuts on the closet bolts. If these bolts are badly rusted, you may need to cut them off. When finished, you can lift the toilet straight up, off the flange to remove it. 3. Crumple an old rag and place it in the soil pipe to block sewer gas — but don’t forget to remove the rag before you install the new toilet! Clean the soil pipe with a putty knife, taking care to remove any remnants of the original wax ring (including the rubber gasket that came with it). 4. Make any repairs necessary to the toilet flange using a repair ring or extender. Then place the wax ring, either regular sized or jumbo, on the flange, making sure that the rubber gasket on the bottom of the ring rests inside the soil pipe. Fit the closet bolts into the slots on either side of the flange. Then, lift the new toilet, align it with the soil pipe and carefully place it on the wax ring so that the closet bolts fit through the holes in the base of the toilet. Tip: Never lift a toilet by the tank because you can easily crack or shatter the porcelain where the tank connects to the base. Always lift from the base! When the toilet is in place, tighten nuts on the closet bolts to fasten the toilet to the flange. Alternate, tightening each side a little bit at a time so that the wax ring is compressed evenly. 5. Hook up the supply line between the shut-off valve and the toilet. Use Teflon tape on metal threads (usually the joint where the valve connects to the supply line. Turn the valve on, allow the toilet to fill, and assess for leaks. You should also flush the toilet several times to check for leaks around the base. If any leaks appear, tightening the leaky fittings should fix the issue. Leaky sink drains are one of the top causes of bathroom floor damage, right after water damage caused by toilets and showers. What’s more, a dripping sink drain — unnoticed for weeks or months — can ruin the vanity, cause mold and mildew issues, and even seep into the wall behind the sink. 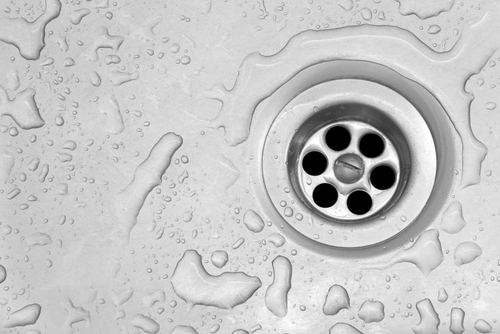 However, those aren’t the only reasons to replace bathroom sink drains. If you decide to replace the sink, then be sure to replace the drain plumbing, since the old plumbing doesn’t always go back together without developing new leaks. Old sink drains are another issue, one that is bound to eventually cause water damage in bathroom walls, floors and cabinets. In fact, if you have a metal sink drain that appears rusty or corroded, or a plastic drain with lots of grime around the fittings, that is a good indication that the drain should be replaced. These are signs that seepage is happening, and even if it isn’t enough to cause damage, it will likely worsen with time. 1. If your drain has a pop-up stopper and you need to remove it, take a look underneath the sink.You’ll see the stopper lever, which is connected to the drain on one side, and to a strap that connects to the faucet pull on the other side. The stopper lever fits through one of the holes in the strap, and is held in place by a simple spring clip. Unfasten the spring clip and slide the stopper lever out of the strap. Then, you can undo the large nut that fastens the top of the drain to the bottom of the sink. If you don’t wish to remove the stopper drain, loosen the nut that attaches the rest of the drain assembly to the stopper pipe, then slide the drain pipe off the stopper pipe. If the bathroom sink doesn’t have a stopper drain (which is rare), you can simply remove the nut that connects the drain to the base of the sink. Be very careful not to apply too much pressure here because you can accidentally warp the drain stub, which makes it difficult to install the new drain without leaks. Loosen by hand if possible, or use gentle pressure with a pipe wrench or large pair of pliers. If you are working with a metal drain, and the nuts holding it together are seized, use spray-on lubricant on the fittings. Wait up to an hour for the lubricant to penetrate the threads of the fittings, then try loosening again. Since P-traps hold water, place a shallow pan or some towels underneath the drain as you remove it to catch spills. 3. At this point, you’ll need to do some cleanup. Make sure the drain stub doesn’t have any dirt, grime or leftover plumber’s putty on it. If you disconnected the drain from the base of the sink, then there will be old plumber’s putty left behind. Use an old credit card, soft putty knife or soft brush to clean both the sink and the threads on the drain stub. 4. To install a stopper drain, make sure to follow the instructions that come with it.Start by placing a bead of plumber’s putty around the drain hole in the base of the sink. Then drop the drain’s strainer through the drain hole so that it rests on the putty. From underneath, attach the tailpiece of the stopper drain by tightening the nut that attaches the tailpiece to the strainer. You can then drop the stopper into the drain; install the horizontal stopper lever; and connect it to the strap that is attached to the sink’s stopper pull. 5. Use a P-trap kit, which should come with all of the parts that you need:e.g., pipes, nuts to connect everything, and several beveled gaskets to prevent leaks at the joints. Start by sliding one of the nuts from the kit onto the stopper drain’s tail pipe, then slide a beveled gasket onto the tailpipe with the thinner side facing downward. Next, slide the P-trap onto the stopper drain, push the gasket into the top of the P-trap and tighten the nut. 6. The second part of the P-trap kit is the tailpipe that connects the P-trap to the drain stub.To install this, slide two nuts onto the tailpipe — one to attach to the P-trap and one to attach to the drain stub. Then slide a beveled gasket onto the tailpipe so that the narrow edge faces the drain stub. Slide the tailpipe into the drain stub, then line up the other end with the P-trap and tighten the nut. Then tighten the nut that fastens the tailpipe to the drain stub. 7. Once everything is put together, inspect the entire assembly and make sure that all nuts are tight.Hand tightening is perfectly fine. If you use a wrench or pliers, you may end up damaging the pipes and causing a leak. Then test the drain by running water for several minutes. If you spot a leak, you may need to tighten the leaky joint a little more. A double vanity is one of those luxury bathroom features that has become an expected staple in modern bathroom design — what modern master bathroom is complete without one? With twin bathroom vanities, two individuals are able to wash up side by side. Each person has his or her own sink, to use anytime, with convenience and comfort. Yet for all their benefits, double bathroom vanities do have some downsides. When you’re in a situation where your double vanities are causing double the trouble, what should you do? To help answer this question, here’s a look at the good, the bad and smart strategies for using a modern double vanity at your home. More efficient routines. With double vanities, you have twin opportunities for brushing your teeth, washing your face, washing your hands, etc., all without having to wait your turn. By utilizing more space for washing up, double sinks enhance household routines and create more efficiency for your home. More space. A second sink also means an extra area with storage and/or counters for use. The expanded space of a second vanity means more room for storing toiletries, etc., in the bathroom. Greater property value. Because double vanities are so ubiquitous in modern luxury homes, most homebuyers see them as an asset. When your bathroom has a twin vanity, it has a selling point that can enhance your overall property value. For these reasons and more, most modern homes that have the space to accommodate double vanities will choose them over a smaller single vanity. 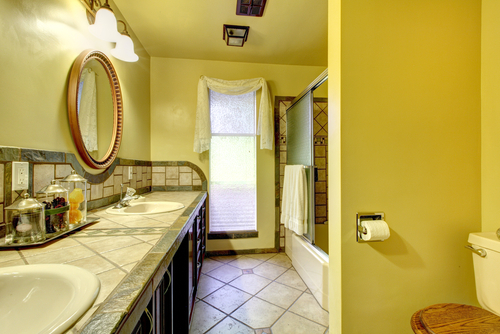 If your bathroom has two sinks, know that you’ve got a feature with selling power! Nonetheless, there can be downsides to double vanities, too. Too much sink, not enough counters: Double sinks are great, but what’s even better is the counter space to go along with them. Think about how you actually use your bathroom. What percentage of time are you using the sink versus applying makeup or fixing your hair? Do you really benefit from the sink, or would it be better to have extra counter space instead? For many homeowners, the answer surprises them. In these cases, double vanities may mean more sink than you need, with not enough counter space. Two clogged sinks: Use any bathroom sink for a reasonable amount of time, and it’s normal to experience drain clogs — but the problem is even worse in a double sink. Because double sinks typically share a drain, any clog on either side can affect both. Annoying plumbing problems: When your double sinks stop working properly, you may have a plumbing problem that’s to blame, and the plumbing problem may be bigger or more frustrating if it affects both sinks. Depending on the complication, you may be able to fix it yourself or you might need to call a plumber. Counter space matters. 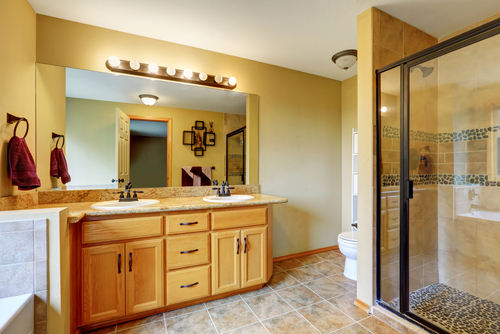 If you’re still in the process of designing a new home and its bathrooms, take time to evaluate vanity options. Whether you have a single sink or double sinks, you may find that the best feature is extra counter space at the vanity. Storage matters. Just because you’re going to have extra sink space doesn’t mean you won’t need extra cabinets. Think of all the products and accessories you keep in the bathroom, and look for a vanity that can accommodate them. Know how to clear a clog. If you run into a situation where one or both of your sink drains are clogged, knowing how to fix the problem will save you the cost of a plumber. What you need to do is get a sink plunger (different from a toilet plunger) to clear the clog. The good news with double vanities is they have a lot to offer. To learn more about double vanities or to find just the right one for your home, shop our catalog at Modern Bathroom.